We’d love your help. Let us know what’s wrong with this preview of Le due verità by Agatha Christie. Un terribile rimorso affligge il dottor Calgary. Per colpa sua, infatti, Jack Argyle è stato condannato per l'assassinio della madre ed è morto in prigione. Il dottor Calgary è sempre stato a conoscenza dell'innocenza di Jack: all'ora del delitto il giovane era con lui, ma lo studioso non aveva potuto testimoniare in sua difesa perchè all'epoca delle indagini si trovava in Un terribile rimorso affligge il dottor Calgary. Per colpa sua, infatti, Jack Argyle è stato condannato per l'assassinio della madre ed è morto in prigione. Il dottor Calgary è sempre stato a conoscenza dell'innocenza di Jack: all'ora del delitto il giovane era con lui, ma lo studioso non aveva potuto testimoniare in sua difesa perchè all'epoca delle indagini si trovava in Antartide con una spedizione scientifica. Ritornato in patria e venuto a conoscenza del processo, il dottore si precipita dagli Argyle per riabilitare la memoria di Jack. La reazione della famiglia, però, è destinata a sorprenderlo: la sua dichiarazione viene accolta con ostilità. La colpevolezza di Jack aveva infatti tranquillizzato tutti, mentre la sua innocenza non fa altro che gettare nuovi, terribili sospetti sugli altri membri della famiglia. Chi è dunque l'assassino della signora Argyle? To ask other readers questions about Le due verità, please sign up. Aristae Henricus Tina's car was definitely red. You really have to admire 1950s for their marvelous plot devices. Amnesiacs, mistaken identities, and in this mystery by Agatha Christie, a man with a concussion fails to provide an alibi, and shortly after recovering, heads off to Antarctica for a research expedition. Barring that somewhat awkward premise, Ordeal was an interesting psychological mystery that kept me engaged. Dr. Calgary, the Antarctic research scientist, discovers through old newspaper articles that he was the missing alibi for You really have to admire 1950s for their marvelous plot devices. Amnesiacs, mistaken identities, and in this mystery by Agatha Christie, a man with a concussion fails to provide an alibi, and shortly after recovering, heads off to Antarctica for a research expedition. Barring that somewhat awkward premise, Ordeal was an interesting psychological mystery that kept me engaged. Dr. Calgary, the Antarctic research scientist, discovers through old newspaper articles that he was the missing alibi for Jack Argyle, accused and convicted of killing his mother. Despite steadily maintaining his innocence, Jack was sent to prison, where he died of pneumonia after only six months. Troubled by guilt, Dr. Calgary consults with the lawyer of the Jack's family, determined to seek them out and assure them of Jack's innocence. He expects a mixed emotional reaction, perhaps to be thanked or perhaps to bear the brunt of their anger for his untimely appearance and information. Unfortunately, the facts of the case have failed to impress Dr. Calgary, and not even the warning from Jack's sister makes it clear: "it's not the guilty who matter. It's the innocent... It's we who matter. Don't you see what you've done to us all?" One of her brothers visits Dr. Calgary at his hotel, examining his story and providing Calgary with the background on his family--and the reason they are so upset by his news. Calgary, shocked, finds himself back at the lawyer's seeking more information, and then proceeds to talk with some of the principles. "I thought that I was ending something, giving--shall we say--a different end to a chapter already written. But I was made to feel, I was made to see, that instead of ending something I was starting something. Something altogether new." Meanwhile, the police, while doubtful of their ultimate success, are determinedly re-opening the case, and eventually Dr. Calgary's goals dovetail with their own. Technically, her writing is impressive. On re-read, I realized how streamlined and exacting her prose is, and all the clever ways she conveys dialogue without resorting to a simple "he said," "she said" format that plagues less experienced writers. "Arthur Calgary walked down the sloping ramp and got into the boat as the ferryman steadied it with a boathook. He was an old man and gave Calgary the fanciful impression that he and his boat belonged together, were one and indivisible." "For a moment a feeling of poignant sadness came over him as he confronted the virile youth of the boy facing him." "Superintendent Huish was a tall, sad-looking man. His air of melancholy was so profound that no one would have believed that he could be the life and soul of a children's party, cracking jokes and bringing pennies out of little boys' ears." "It was a pretty, rather vapid little face, plastered with make-up, eyebrows plucked, hair hideous and stiff in a cheap perm." Writing like this reminds me of the certain degree of sloppiness I see in current writers who are churning out book after book. Easy enough to do, if your last ten books bore any resemblance to Parker phoning in Bad Business or Evanovich and her umpteenth Plum fiasco. But Christie wrote for over 40 years and had 66 detective novels to her credit; while not all of them hit excellence, I'm not sure they fell quite to those depths. Grand Dame indeed. Note: Christie does show her upper class British upbringing in this one. One character is referred to a "half-caste" and a "dark horse." I assumed the dark-horse to refer to her status as a potential murderer, but it could be a racial remark. She ends up being quite a sympathetic character so it bothered me less than it could have. At any rate, four stars for Christie's delicious period piece and managing to surprise me with a couple different twists. Every time Christie makes her stories revolve around a big and extraordinarily dysfunctional family, I invariably find myself utterly spellbound. The same happened with Appointment With Death; but the mystery in the latter was certainly more satisfying, as I see it. I would have liked -and expected- a more imaginative solution, I think. EXCERPT: Calgary came to the end of the nice new road with the nice new houses on either side of it, each with its eighth of an acre of garden; rock plants, chrysanthemums, roses, salvias, geraniums, each owner displaying his or her individual garden taste. At the end of the road was a gate with SUNNY POINT in Gothic letters on it. He opened the gate, passed through, and went along a short drive. The house was there ahead of him, a well-built, characterless modern house, gabled and porched. It mi EXCERPT: Calgary came to the end of the nice new road with the nice new houses on either side of it, each with its eighth of an acre of garden; rock plants, chrysanthemums, roses, salvias, geraniums, each owner displaying his or her individual garden taste. At the end of the road was a gate with SUNNY POINT in Gothic letters on it. He opened the gate, passed through, and went along a short drive. The house was there ahead of him, a well-built, characterless modern house, gabled and porched. It might have stood on any good class suburban site, or a new development anywhere. It was unworthy, in Calgary's opinion, of its view. For the view was magnificent. The river here curved sharply round the point almost turning back on itself. Wooded hills rose opposite; upstream to the left was a further bend in the river with meadows and orchards in the distance. Calgary looked for a moment up and down the river. One should have built a castle here, he thought, an impossible, ridiculous fairy-tale castle! The sort of castle that might be made of gingerbread or frosted sugar. Instead there was good taste, restraint, moderation, plenty of money, and absolutely no imagination. For that, naturally, one did not blame the Argyles. They had only bought the house, not built it. Still,they, or one of them (Mrs Argyle? ), had chosen it. . . He said to himself, 'You can't put it off any longer. . .' and pressed the electric bell beside the door. ABOUT THIS BOOK: Recovering from amnesia, Dr. Arthur Calgary discovers that he alone could have provided an alibi in a scandalous murder trial. It ended in the conviction of Jacko Argyle. The victim was Jacko's own mother, and to make matters worse, he died in prison. But the young man's innocence means that someone else killed the Argyle matriarch, and would certainly kill again to remain in the shadows. Shaded in the moral ambiguity of murder, the provocative psychological puzzler of guilt, vengeance, and blood secrets is among Agatha Christie's personal favorites. MY THOUGHTS: I was excited to discover, I thought, a Christie that I hadn't previously read. But once I got into it, I realized that I had previously read it, and had also seen the TV adaptation, and a very good one it was too. But not to worry, as I couldn't remember 'whodunit'. So I got to read and enjoy this stand-alone mystery all over again. And to be wrong, all over again, about just who the murderer was. A delightful 😍😍😍😍 murder-mystery. THE AUTHOR: Agatha Christie is the best-selling author of all time. She wrote eighty crime novels and story collections, fourteen plays, and several other books. Her books have sold roughly four billion copies and have been translated into 45 languages. She is the creator of the two most enduring figures in crime literature-Hercule Poirot and Miss Jane Marple-and author of The Mousetrap, the longest-running play in the history of modern theatre. DISCLOSURE: I listened to Ordeal by Innocence by Agatha Christie, narrated by Hugh Fraser, published by HarperCollins Publishers Limited via OverDrive. All opinions expressed in this review are entirely my own personal opinions. 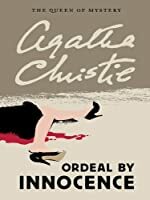 I've been reading away on my Agatha Christie project for a while, and although the books tend to, with exceptions, follow a formula, there are other issues or themes that Christie discusses in the different books. This could be anything from discussing morality and justice (as she does in Orient Express and And Then There Were None) to superstitions (as she does in Endless Night). She's not always successful with this in the sense that she makes a valid argument or finds common ground with the sensibilities of her readers - tho, maybe she was more successful with the latter in her own time - but she does pick up topics for discussion that have nothing to do with the murder plot itself. In Ordeal by Innocence, Christie dedicates her "side discussion" to the topic of adoption. ‘It was a fine thing to do,’ said Philip. ‘You understood that, I suppose, all along,’ said Philip. Having read her points, it seems Christie argues that adoptive parents can never have the same bond with "their" children as natural parents and that all adopted children will carry a chip of rejection on their shoulder. I am not going to argue for nor against this thesis, but I do acknowledge that there is a lot of controversy in Christie's statements on the subject of adoption in this book. There is no indication of what made Christie bring this up other than to have a side discussion in the book, but to me these side issues - however controversial or even offensive they may be - are an aspect of what I enjoy about the books. I guess, Christie's use of the uncertainty about familial trust as the major drivers of plot in this particular mystery makes it quite similar to Appointment with Death, but family set up is completely different in this story. It has been fun to watch the mystery unravel, knowing that the similarity with her other books is just one of the red herrings that Christie is so famous for. ...Therefore begins the ordeal - the ordeal of those who are innocent. This is a very tightly written story and entirely believable - again, one where excessive use of coincidence (a failure of Christie) is avoided. The narrative moves like a movie by Hitchcock, and when the surprisingly logical conclusion is revealed, we kick ourselves for not seeing it coming. Desisto. Es imposible pillar a esta mujer y adelantarte a sus pasos. Me he llevado todo el libro pensando que este me gustaría menos que los demás, porque creía saber la solución y me parecía muy obvia. Tenía la idea de que ya le había cogido el punto y había ido viendo donde ponía las pistas. Pero para nada. Como siempre me he vuelto a quedar impactado con el final y no tenía nada que ver con lo que yo creía. Y lo fuerte es que siempre deja pistas. No se las saca de la manga al final. Y nunca l Desisto. Es imposible pillar a esta mujer y adelantarte a sus pasos. Me he llevado todo el libro pensando que este me gustaría menos que los demás, porque creía saber la solución y me parecía muy obvia. Tenía la idea de que ya le había cogido el punto y había ido viendo donde ponía las pistas. Pero para nada. Como siempre me he vuelto a quedar impactado con el final y no tenía nada que ver con lo que yo creía. Y lo fuerte es que siempre deja pistas. No se las saca de la manga al final. Y nunca las veo. Esta mujer es increíble. I usually avoid comparing movies to books as in comparing apples to oranges....but since I graced my teeth on this Christie story first through Prime's version of the haunting tale, I can't help but constantly compare when reading and reviewing. I knew when watching the three-part series that Christie would not have been racy enough to put in the themes of child abuse, abortion and molestation in her book, and I was right when reading this to check it out. Some of the stuff may have almost been implied, and while Amazon took liberties when creating the film, I can see where they get a little of their source material. Honestly the movie told a stronger story because it focused on characterization and dysfunction more so than its predecessor. One of the biggest changes was of the witness himself, who the movie version chose to make a weaker and mentally confused character versus the self-assured, professional character in this book. The ending is drastically different and less demented. Rating the book by itself, the plot is slower moving due to so many points of view detecting. We have chapters devoted to the police talking amongst themselves, the witness speaking to the police, the witness speaking to the family, and the family talking amongst themselves. The family is the heart of the story, so the scenes with them are the most interesting. There aren't really many clues. It's more of a study with a weird family when the mother took in orphaned children and tried to force their love by giving them "good lives." Seeing the way the father felt ignored, the way the mother kept filling her house with children to try to get her heart fulfilled, and how the children went from scheming to resentful was fascinating. I don't remember her other books delving as deeply into the taboo of adoption and twisted mother control, but Dame Christie has a knack for digging deep into hidden dark heart of society with her books. Did you kill the Argyle matriarch? ‘Tis true, she was an awful sort. A control freak: dramatically highly-strung and passionately venomous, her grasping hands ever eager to twist and to bind, to bind you and others to her. She is played by Faye Dunaway in tiny flashback sequences and that is certainly apropos casting. Mama Argyle was ever so unfair to you. She never let you do what you wanted, it was always her, Her, HER! She deserved to die, damn it! The world is a bet Choose Your Own Adventure! Did you kill the Argyle matriarch? ‘Tis true, she was an awful sort. A control freak: dramatically highly-strung and passionately venomous, her grasping hands ever eager to twist and to bind, to bind you and others to her. She is played by Faye Dunaway in tiny flashback sequences and that is certainly apropos casting. Mama Argyle was ever so unfair to you. She never let you do what you wanted, it was always her, Her, HER! She deserved to die, damn it! The world is a better place without her! The world should congratulate you! At the very least, they can give you some small bit of understanding for the good deed you've performed. If you decide that the best defense is a good offense, choose this path. Για τη δολοφονία της κυρίας Αργκάυλ δεν υπήρξε κανένα μυστήριο. Ο θετός της γιος Τζακ συνελήφθη αφού έγινε γνωστό ότι της ζήτησε χρήματα που δεν του έδωσε και στη συνέχεια την απείλησε. Τα χρήματα που της είχε πάρει βρέθηκαν επάνω του και κανείς δεν ξαφνιάστηκε μια και ο νεαρός Τζακ ήταν, κατά κοινή ομολογία, "κακός σπόρος". Όλα όμως ανατρέπονται όταν δύο χρόνια μετά τη δολοφονία και αφού ο Τζακ έχει πεθάνει εμφανίζεται ένα ακλόνητο άλλοθι για τον συλληφθέντα. Τότε η αλήθεια, που τόσο βολικά έχε Για τη δολοφονία της κυρίας Αργκάυλ δεν υπήρξε κανένα μυστήριο. Ο θετός της γιος Τζακ συνελήφθη αφού έγινε γνωστό ότι της ζήτησε χρήματα που δεν του έδωσε και στη συνέχεια την απείλησε. Τα χρήματα που της είχε πάρει βρέθηκαν επάνω του και κανείς δεν ξαφνιάστηκε μια και ο νεαρός Τζακ ήταν, κατά κοινή ομολογία, "κακός σπόρος". Όλα όμως ανατρέπονται όταν δύο χρόνια μετά τη δολοφονία και αφού ο Τζακ έχει πεθάνει εμφανίζεται ένα ακλόνητο άλλοθι για τον συλληφθέντα. Τότε η αλήθεια, που τόσο βολικά έχει θαφτεί για όλους, πρέπει να έρθει ξανά στην επιφάνεια. Η οικογένεια βυθίζεται στην καχυποψία και την δυστυχια, μια και κανεις δεν μπορεί να είναι απόλυτα σίγουρος για τον άλλον. Οι σχέσεις διαρρηγνυονται και η αθωότητα δοκιμάζεται. One of Christie’s must read thrillers. Written in her true who-dun-it fashion the plot has an interesting beginning. True a murder has been committed and innocent person is jailed where he later dies. The stage is set and there is usual bunch of suspects. It is not the police but an amateur sleuth who finally solves the case. Great read. A classic Christie tale which explores the central theme - "If you love someone dearly, how far would you go to protect them". Instead of Poirot or Marple, we have a bespectacled geophysicist investigating a crime to which he was an alibi to the hanged murderer, in a family which is dysfunctional at its core and only a thin veneer of sanity covering it up. As you read, our protagonist peels those layers to reveal the true murderer and the hidden crime of many years ago. Ick. Not one of Christie's best. Not even close. It's the standard detective story set-up: a murder, a finite set of would-be-murderers, no one has a motive/everyone has equal motive. The twist here is that a man has been convicted, and has died in prison before his alibi turns up. 1. Arthur Calgary, the hero. This is the alibi, the scientist who turns up two years too late to provide evidence that the convict Ick. Not one of Christie's best. Not even close. It's the standard detective story set-up: a murder, a finite set of would-be-murderers, no one has a motive/everyone has equal motive. The twist here is that a man has been convicted, and has died in prison before his alibi turns up. 1. Arthur Calgary, the hero. This is the alibi, the scientist who turns up two years too late to provide evidence that the convicted murderer didn't actually commit the crime. He's too earnest and too naïve to think that the victim's family would be unequivocally happy when he turns up with the evidence. Is it too much of a stretch for him to realize that now they'll turn their thoughts to who actually did it? That they would look at each other and wonder? Apparently, this thought is the last in his head. It needs to be spelled out at least three times before it takes root in head, which brings me to point #2. 2. Everything is spelled out too many times. See point 1. We get several descriptions of all the characters involved, from multiple perspectives (supposedly). The fun part is that everyone comes to the same conclusions, no one adds anything new. It's just adding to the page count, and my sour temper, nothing else. It's not just thoughts that are repetitive, it's also physical traits. Everyone who meets Tina calls her a black cat. Everyone who meets Micky says he's bitter, but about what? And then go on to speculate about the reason. Everyone who sees Hester calls her dramatic. And so on and so forth. Annoying to say the least. 3. Christie makes a really horrid case for adoption in this book. Several times we're told that the children (adopted all) were given everything they wanted, and they still turned out to be ungrateful, unloving and downright criminal. You see, that's the thing that's apparently their genes. Several times she says that Rachel devoted all her time to her kids because her maternal instincts were unsatisfied - she hadn't borne any children. This got on my nerves - I didn't think Christie had any books were she got on a soapbox. 4. Several times she says - women are ruthless. Women can do anything, can plot anything. Seriously? That seems irresponsible to the core, for a mystery writer, to insinuate such broad freaky statements. I liked this one, but it was kinda disappointing, the events were a bit dull, I could figure out half of what happened pretty easily, but the second half in the end was great. I’m beginning to think that I prefer Christie’s standalone titles over her more famous Poirot novels. While I’ve mildly enjoyed those, I adored And Then There Were None. And the completion of this novel confirms my suspicions, because this book was fantastic. Dr. Arthur Calgery, having just come back from a years long expedition to Antarctica, finds himself in a dire situation. Before he left, he offered a lift to a hitchhiker from the side of the road and never saw him again. Afterwards, he gets out of his car and subsequently gets hit by another car and winds up with a concussion, thereby temporarily erasing the memories of the previous events. When he returns, he happens upon a newspaper article detailing the death of a Jacko Argyle, who was accused and sent to prison for the murder of his mother Rachel. He soon realizes that this same man was the one he gave the lift to, which was the dead man’s alibi at the time. Since no one could confirm it, it was thought to be a lie. But now with Calgery’s memory restored, he soon realizes that an innocent man was wrongly convicted. Eager to share the news with the police and Jacko’s family, he shares with them his memory of that night, convinced that a new investigation will be opened and the family will be grateful to him for clearing their son’s name. Cause they’d be happy about such a thing, right? This isn’t so much a murder mystery as it is an examination of the psychology of innocence. And I think that is in part why I loved it so much. We get an inside look at a seemingly perfect family who has everything they ever wanted, but in reality have enough secrets to keep the Whisper app running for the next three generations. It’s the story of a man, even though he was wrongly accused, doesn’t aspire much in the way of sympathy from his own family. It’s as if they wanted him to be guilty; as if their lives would be ten times easier without him in the picture. Throughout the entire novel, I couldn’t find one character who had a single nice thing to say about him. Calgery, the voice of reason in the novel, said it best; no matter how awful he was perpetuated to be, someone should care about him and whether his name should be cleared. It’s the story of five children who were given everything they wanted by a woman who wanted to give them the entire world, and yet they resented her for it. As if she was buying their love rather than giving them the love they felt they were entitled to. Smothered by her overbearingness and unwillingness to let them go. Five kids who once belonged, but now belong nowhere; maybe never have been. And how those five children would become four, and are never quite able to get out from their delinquent brother’s scandal. It’s the sad, sad tale of a man who loved his wife dearly, but who seemed to ignore him for her adopted children. All her time, energy and love was given to the children she so desperately wanted and worked so hard to have, and there simply wasn’t any love leftover for him. How he’s starved for affection and caring or for someone to notice him for once in his goddamn life. How he finds that one person, that one woman who’s willing to give it to him and love him for who he is and what he can give her. I loved how this book studied that and more. Christie really knows how to get into the deep recesses of human psychology and feelings to really analyze them; to use them to the character’s advantage (and the reader’s disadvantage, as you never fully know what the characters are thinking). I loved the gradual peeling back of layers of the characters and how their true colors and personalities slowly came out. I also loved the mystery as a whole. We think we know who did it, why they did it, and how they did it... except for the fact that they didn’t do it. What on earth would you do then? And would it be worth it to even try and pursue it? Despite how gloriously wonderful I thought this book was, there were two little quibbles that made me not give this a full five stars (but it was close, believe me). The first quibble I had concerned the issue of adoption. The author took quite a strong stance on the fact that adoptive children feel no real affection for their adoptive parents; only hatred. How they all want nothing more than to go back to their real family somewhere off in the distance. From experience, I can tell you that this is simply not the case, especially if the child was adopted right after birth. There simply aren’t any memories there for them to cling onto to remember. Adoption is a beautiful thing for so many people, so I was kind of miffed that she made it seem so negative in her writing. The other quibble I had was concerning the second youngest child, Christina. Christina is a “Halfling” (aka half Caucasian, half black). Much was described about her ‘sleek’ appearance and ‘feline quality’ and ‘docile, half-caste nature’. I get it, it was a different time and attitudes were much less progressive then they are today, but it was still kind of disturbing to read about. This jewel of a Christie book is about many things; justice, guilt, remembrance, and identity. But most importantly, it’s the story of innocence. How justice is decided and how innocence is left behind in the process. I think my watching of the BBC adaptation shortly before reading it hampered my judgement of this book. However, I still believe I would have rated it ‘disappointing’. I had heard that the plot had been altered for the screen version – hmm, worth investigating – but I couldn’t get out of my head the paradox of the location (‘Sunny Point’ and ‘Drymouth’ – filmed in Scotland? Come on!) – nor the actors’ faces that were emblazoned on the cover of the new paperback edition I bought. The ‘original’ sto I think my watching of the BBC adaptation shortly before reading it hampered my judgement of this book. However, I still believe I would have rated it ‘disappointing’. The ‘original’ story is set in a notional Devon (the author’s home county), and the topography more plausible. Ordeal By Innocence certainly begins with a clever premise – a wife-and-mother is murdered; one of her adopted sons is found guilty and dies in prison. Two years later a witness comes forward to exonerate him. The killer must still be at large – and probably in the midst of the extended family. There ends the good bit. Two systematic flaws now serve to undermine a promising idea. The first is the lack of a single investigator. This story is crying out for Poirot or Miss Marple. In their stead, the responsibility shifts haphazardly from the police, to the ‘whistleblower’, to one of the suspects (the latter seeming to show the greatest insight). Secondly, that the crime is historic and remains the prime focus provides little room for manoeuvre. There are only so many ways that the characters can issue denials – where they were, what they did, and whom they might suspect. So the narrative becomes something of an ordeal by repetition. A sudden flurry of mayhem towards the very end flatters to deceive – but as the denouement unfolds it fails to rescue what is an uncharacteristically prosaic novel; the socio-psychological explanation for events proves tenuous and poorly founded. With hindsight I’m not surprised that the BBC’s screenwriter made wholesale changes! Agatha Christie claimed that, of all her many novels, Ordeal by Innocence and Crooked House pleased her best. Crooked House is one of my absolute favorites, but I had rather forgotten how very good Ordeal by Innocence is. The premise is gripping: an innocent man convicted wrongly of murdering his adopted mother has died in prison, but new evidence shows that he had an alibi. This means that the murderer is still at large, but it must be a member of his family. The closed setting of the family ci Agatha Christie claimed that, of all her many novels, Ordeal by Innocence and Crooked House pleased her best. Crooked House is one of my absolute favorites, but I had rather forgotten how very good Ordeal by Innocence is. The premise is gripping: an innocent man convicted wrongly of murdering his adopted mother has died in prison, but new evidence shows that he had an alibi. This means that the murderer is still at large, but it must be a member of his family. The closed setting of the family circle within their English mansion creates a claustrophic feeling; anyone could have done it, but we simply don't know which of them. I read the novel quickly because I was so anxious to learn the solution. Christie plays fair: the killer isn't anyone outside her stated suspects, and yet I still had it all wrong because the motive was not what I thought--thanks to some very clever red herrings and other misdirection, although the information we need is clearly given. I had the sense of having been outmaneuvered in a mental chess game with the Queen of Mystery! Ordeal by Innocence has certain themes that Christie explored elsewhere, such as justice for all--even the unlikeable. Jacko isn't a sympathetic figure any more than the falsely-accused man in Mrs. McGinty's Dead was, but in both cases we are shown that it doesn't matter. Jacko was a crook, but he didn't deserve to die for a murder he did not commit. Also, the theme of the cold case is one to which Christie returned again and again (my favorite examples are Sleeping Murder, Dumb Witness, and Nemesis). How can our likeable amateur, Dr. Arthur Calgary, solve the murder from two years prior? I am not sure how to rate this. On one hand, it had all the elements I love in a murder mystery - murder within the family, a large number of suspects, family drama, and some humour. But Ordeal by Innocence also bashes you on the head with Christie's private views about adoption and heredity, which are basically utter nonsense. Every chapter contained a polemic, expressed by different people, against adoption and how a mother can never be a mother unless she gives birth. It's annoying to read, e I am not sure how to rate this. On one hand, it had all the elements I love in a murder mystery - murder within the family, a large number of suspects, family drama, and some humour. But Ordeal by Innocence also bashes you on the head with Christie's private views about adoption and heredity, which are basically utter nonsense. Every chapter contained a polemic, expressed by different people, against adoption and how a mother can never be a mother unless she gives birth. It's annoying to read, especially since it's repeated far too many times. Rachel Argyle gets married and couldn't have kids. So she chooses to adopt children. But according to everyone else in the book, she could never be a proper mother since the children were not really hers, even though she did everything possible for them that a mother would. And all the children hated her because she was always right. Really? Anyway, someone in the family finishes her off. Now, who could that be? Well, of course, Jacko, the delinquent son, who could never be one of her own children *eyeroll*. Months later, evidence comes out that Jacko was actually innocent. So the murderer is still free. An entertaining mystery and one in which I didn’t entirely predict ‘whodunit’ but also didn’t care all too much about who did it either. The characters were okay but all felt very similar and somewhat flat. However, it was an entertaining read, just not as gritty or addictive as I was hoping it would be, having read and loved another of Agatha Christie’s titles a few months previous to this. I went on a Christie campaign in the 80's and read everything my local library had. (There was no inter-library system at the time.) I thought I'd done good, read almost every Hercule Poirot, Miss Marple and those Tuppence-and-whoever books Ms Christie wrote. Also read a few non-series numbers. I liked the vast majority of them. Absolutely loved a few. It's the story of a man who can provide an alibi for another man convicted of murder. Problem is the first man, Calgary, got a concussion, then went out to Antarctica for a spell. (You know how it is, he got busy.) He didn't read the papers, or read that much, and with no internet - the year is 1958 - these things happen. When he finally gets home, he realizes, hey I can verify that the guy who supposedly murdered his adoptive mother didn't. I mean, no way he did; he was with me at the time of the supposed crime! Problem is when Calgary reports this to the family's lawyers, then the family, they are none too happy. If their (adopted) brother didn't kill the mother, then who did? And by the way, the 'killer' has recently died of pneumonia in prison. It's a great set-up. There are multiple family members, and a servant, who could well be the real killer. Now everyone starts looking at everyone else with dagger-eyes. Who did it? Did you do it? How about Dad, sister, brother, brother-in-law, dad's secretary? Who killed Mom, filthy-rich Mom, actually. When the accused, named Jacko, is arrested, tried, convicted for the murder of his (adoptive) Mom, he clearly KNOWS who the REAL KILLER IS. Why didn't he say or do something? He's written up as a charming ne'r-do-well, a guy in and out of trouble constantly. He's got a whole list of petty crimes against him. He's never had a problem using people, including his family, so since he KNOWS who the killer is, which is made plain at the end of the book, why didn't he speak out against him or her? No, he allows himself to be arrested, tried, convicted and sent to prison where he dies of pneumonia. This MAKES NO SENSE, Agatha. I am gravely disappointed. Anyhow, the writing is great, the suspense terrific, and I enjoyed every minute of reading it until the very end. In many Agatha Christie stories there is a crime & a large number of suspects. Here she shakes things up a little by having the murderer already sentenced & in prison. He then dies of pneumonia & (if that wasn't enough) someone comes along to prove he was actually innocent. Unfortunately far too much of the novel is taken up with characters discussing who the real murderer might be & this soon becomes so repetitive that I no longer cared who committed the crime. I think the story w In many Agatha Christie stories there is a crime & a large number of suspects. Here she shakes things up a little by having the murderer already sentenced & in prison. He then dies of pneumonia & (if that wasn't enough) someone comes along to prove he was actually innocent. Classism time in classism town. More precisely, "adoption is unnatural, adoptive children and parents never truly and properly bond the way biological children and parents do, and all good women desperately long to have their own babies" time in [ibid. :] town. Also a lovely running theme about how the one daughter who's half-black and half-white, to whom everyone refers as "half-caste," is all inscrutable and cat-like as has no sense of time because she's half-black. With Aggie, it's all nature, Classism time in classism town. More precisely, "adoption is unnatural, adoptive children and parents never truly and properly bond the way biological children and parents do, and all good women desperately long to have their own babies" time in [ibid. :] town. Also a lovely running theme about how the one daughter who's half-black and half-white, to whom everyone refers as "half-caste," is all inscrutable and cat-like as has no sense of time because she's half-black. With Aggie, it's all nature, I guess, except when it's convenient to blame things on a terrible woman who had to adopt children and because she didn't fulfill her biological urges she over-mothered them and smothered them and ruined them. But of course they started ruined, because they came from trash. I liked this better than the miniseries. The miniseries isn't bad, keep that in mind. It's actually very good and I really liked watching it. However, it's very melodramatic and packed full of *~controversial~* stuff that misdirects and kind of links in with current events, such as the #MeToo movement. And, when I decided to read the book after watching it, it really came across as campy. Mr. and Mrs. Argyle get married and Mrs. Argyle wants to have a family. However, they couldn't get pregnant. So, Mrs. Argyle starts adopting a bunch of unwanted children, paying off the parents and bringing them into her home. She ends up with five. Mary, Jack, Tina, Micahel, and Hester. Then, Jack kills his mother. The story picks up months after Jack's conviction and subsequent death in jail with a man coming to say that he's Jack's alibi. And, hidden feelings start becoming more apparent as the investigation begins again. Now, I thought that the miniseries would have kept the same ending. But, it didn't. It changed it. So, I was reading it looking for the clues that the book dropped to lead me to the killer. But, it wasn't. I really think I liked the miniseries ending better, although it was terribly melodramatic and made me roll my eyes while watching. Still, I liked the killer better. One slight, random, issue I had is that this didn't age really well. The part I'm talking about is Tina. Tina is half-white, half-Indian. Throughout the book, she's referred to as "half-caste" and it just comes across as so racist. It made me cringe. That part didn't age well and, honestly, Tina's race didn't play into the story at all so it felt a pointless addition to the characters. This is one of the last Christie's I'll be reviewing for the Cool Down With AC challenge this summer. I fell a little behind schedule when I needed a break from the Christie a week schedule I was on. This is one of the stand alone novels and was one Agatha Christie's top ten personal favorites making a must read. In this novel we have Dr. Arthur Calgary, who after having suffered a concussion, suddenly remembers an important piece of information in a murder case. Unfortunately by the time he deli This is one of the last Christie's I'll be reviewing for the Cool Down With AC challenge this summer. I fell a little behind schedule when I needed a break from the Christie a week schedule I was on. This is one of the stand alone novels and was one Agatha Christie's top ten personal favorites making a must read. In this novel we have Dr. Arthur Calgary, who after having suffered a concussion, suddenly remembers an important piece of information in a murder case. Unfortunately by the time he delivers the news, the son of the family has died in prison after being accused of the murder of his adopted mother. Dr. Calgary swears that he can provide an alibi for the son Jacko for the time of the murder and is somewhat mystified when no one in the family seems very happy to hear the news. It turns out, the mother Rachel was a somewhat polarizing figure in the family. She adopted many children during the war but it seems that it was to fulfill a need in her rather than a need in them. You would think that the largely poor and abandoned children would feel only happiness at being adopted into a wealthy loving family but this is not the case for all of them. Things aren't what they seem in typical Christie fashion and the hunt is on for Rachel Argyle's true killer before the victim count stacks up. A classic murder mystery. This is a standalone mystery and I would have preferred a bit of Hercule or Miss Marple but the characters in this are still very strong and made for a good story. like a 3.7 rounded up. While I see that a lot of readers don't agree with me, I found Ordeal by Innocence to be quite a good read. I get that for many people the draw in a Christie novel is Poirot getting his little grey cells all stirred up or waxing his moustaches, or Miss Marple innocently knitting away while taking stock and careful observation of everything and everyone while the cops tend to flounder, but really, the non-detect like a 3.7 rounded up. While I see that a lot of readers don't agree with me, I found Ordeal by Innocence to be quite a good read. I get that for many people the draw in a Christie novel is Poirot getting his little grey cells all stirred up or waxing his moustaches, or Miss Marple innocently knitting away while taking stock and careful observation of everything and everyone while the cops tend to flounder, but really, the non-detective novels can be just as good in my opinion. While the premise here is very different, this book reminds me a bit of Christie's Crooked House, in which an outsider is brought in to help get to the truth of a murder in the family, precisely because one of the family hopes to negate the idea that "it could be one of us." Here though, there's a bit more happening beneath the story's surface; as just one example, nature vs. nature is a big theme that is explored using the lives of the Argyle siblings, all of them adopted, and while we might think nowadays that this is sort of old hat, don't forget that this book was written in the late 1950s so it opens a small bit of a window onto a particular mindset of a particular time. There's more, of course, especially in trying to fathom the murder victim's (Rachel's) personality, which is an excellent psychological study unto itself. This review has been hidden because it contains spoilers. To view it, click here. So many interesting characters in this book, but my personal favourites are Hester & Philip. Philip's death broke my heart, but at least we got a happy ending, i find Dr Arthur Calgary actually perfect for Hester. Definitely one of my favourite books, i would enjoy it even more, only if i didn't spoiled it to myself by watching a movie adaptation..
“He felt lost without his hatred–lost and afraid.